Judges should be of stern stuff and tough fibre, unbending before power, economic or political, and they must uphold the core principle of the rule of law which says, 'Be you ever so high, the law is above you.' This is the principle of independence of the judiciary which is vital for the establishment of real participatory democracy, maintenance of the rule of law as a dynamic concept and delivery of social justice to the vulnerable sections of the community. These words of the Supreme Court of India in first judges transfer case elucidate the expectation from its judges. Mr. Justice Jagdish Singh Khehar, perhaps more than any other contemporary Indian judge, has demonstrated this stern stuff and tough fibre. Erudite, possessed of intellectual sensitivity and judicial courage,he led the five-judge constitution bench which struck down the NJAC Act. Justice Khehar also headed a bench that first time reinstated the Congress-led Arunchanl Pradesh Government and held all the actions of the Governor violative of the Constitution. Referring S R Bommai v. Union of India [(1994) 3 SCC 1] the bench allowed that it had “all the powers to put the clock back.”Off the bench, Justice Khehar on occasion of Constitution Day celebration responded to the diatribe from Attorney General for India, by saying that the judiciary is functioning within its “lakshmanrekha.”The two judgments of Justice Khehar had placed government in an uncomfortable situation therefore, speculations of third supersession were obvious in corridors of Supreme Court. However, his being from Sikh community and from State of Punjab facing assembly elections or whatsoever reason,Government surfaced the way for first Sikh to reach the highest judicial office in the country. Hon’ble Justice J. S. Khehar has taken oath as 44th Chief Justice of India on January 4, 2017 with uphill tasks ahead. It was Justice J.S. Khehar who gave new life to the collegium system after declaring the government’s NJAC law unconstitutional. Majority view, however, was reprimanded by Justice Chelameshwar as repugnant to the spirit of the Constitution. Criticizing the functioning of present collegium system, Justice Chelameshwar ardently observed; it was impervious and inaccessible both to public and history, barring occasional leaks. Absolute independence of any one of the three branches is inconsistent with core democratic values and the scheme of our constitution. The amendment only seeks to restore such balance and therefore cannot be said to be destructive of the basic structure of the constitution.Later, he refused to participate in the meetings of collegium. 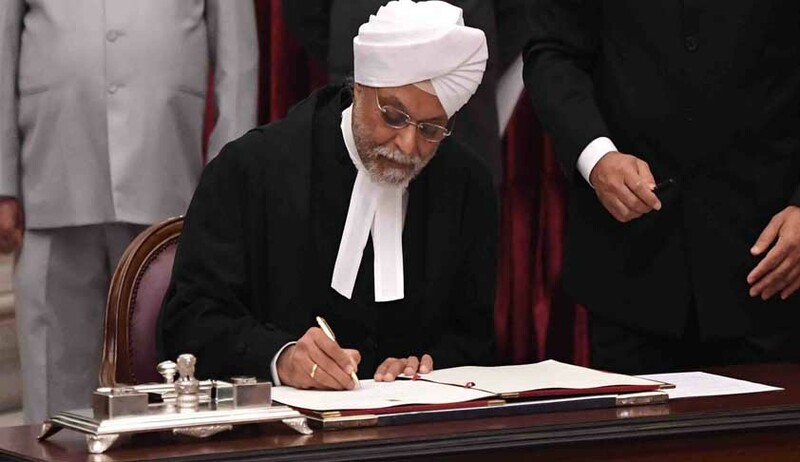 Though, Justice Khehar proceeded on to invite public opinion on ways to improve the opaque collegium system of judicial appointments and after receiving over 11,500 views from the public, the Bench directed the government to draft a new Memorandum of Procedure (MoP). This MoP is a persistent bone of contention between the Centre and the Supreme Court. The first instant challenge before the new Chief Justice therefore would be to comprehend this dream of majority in NJAC case. It is now inevitable for the Chief Justice of India to unknot the predicament by addressing genuinely queried issues of transparency and accountability in the functioning of collegium otherwise conscience of people is bound to be daunted. Delay in filling vacancies in the sanctioned strength of Courts and in increasing the sanctioned strength with increase in the institution of cases, renders the judiciary inadequate to deliver its constitutional mandate. Bringing the judiciary into this state of inadequacy, has been the singularly constant finding of all Government Committees and Commissions on Arrears in Courts. All these fact-finding bodies have unvaryingly recommended increasing the strength of judges[See Rankin Committee 1925 to the 189th Law Commission Report of 2004]. These recommendations as those of the All India Chief Justices Conference have remained unimplemented. The same applies to the implementation of the orders of the Supreme Court in All India Judges Association vs Union of India [(1993) 4 SCC 288] followed by Brij Mohan Lal vs Union of India [(2002) 4 SCC 247].As there is a national debate on pending cases or arrears, new arrears are accumulating daily. Putting courts in a situation whereby Judges are enable to deliver the public's fundamental right to timely justice is to deny access to justice and thereby undermine the sole purpose of judicial independence and constitutionalism. Hence, the second major challenge before Chief Justice would be to foster the relationship where appointment process moves smoothly. There is no magical scale to resolve present judicial crisis. Increasing judge’s strength echoed by emotional outburst of the previous Chief Justice will not fix all problem per se. The government and civil society are constantly raising their voices as to what initiatives Supreme Court has taken for ensuring more accountability in the judicial wing. Why constitutional courts in India still follow the archaic ritual of long vacations? Why Supreme Court is not able to take concrete steps to abolish the culture of adjournments? Why have initiatives not been taken to reform the Bar and to make it more accountable to the people? The Chief Justice who had taken tough decisions in judicial capacity has to roll the ball from his side by making some positive and reformative measures otherwise judiciary of largest democracy will succumb under the weight of its own responsibility and it will be difficult to resuscitate the diminishing confidence of people in the judiciary. Justice J. S. Khehar had assumed office on January 4, 2017 and will retire on August 27, 2017, with a discourteous summer vacation of one and half months. In such a short stint,no one will be able to accomplish his dream.Then question on the functionality of ritual that senior most judge shall be the Chief Justice of India too become relevant. In the absence of any constitutional provision this convention was nurtured (with two exceptions) to avoid any controversies in the appointment of Chief Justice of India. But this convention heaves rapid succession of the CJIs with short stints of one, two or three months.Within Supreme Court structure all powers revolve around the office of Chief Justice and in the absence of fixed tenure, no Chief Justice can hope to reform the judiciary and thereby ensure its independence from the executive on aspects other than the appointment of the CJIs. Dr Yogesh Pratap Singh is an Associate Professor of Law at National Law University Odisha and currently on deputation as Deputy Registrar, Supreme Court of India.